​Position: Research Assistant and Laboratory Manager. 1996 Bachelor of Science (Zoology), The University of Queensland. 1998 Bachelor of Science Honours, The University of Queensland. "Acute Impacts of Selected Pesticides on Estuarine Meiofauina". Supervisors Assoc. Prof. Jack Greenwood, Dr Ian Tibbetts and Dr Michael Brown. Research Interests: Cleaning behaviour, Coral Reef Ecology, Estuarine Ecology. The main project Bronwyn has been involved with so far is to determine the external and internal parasite communities present in a range of larval coral reef fish species. Following from this has been the investigation of the effects of gut parasites on the swimming ability of recruiting individuals using swim trials. She is also working on a long-term experiment involving the removal of cleaner fish from reefs on Lizard Island. 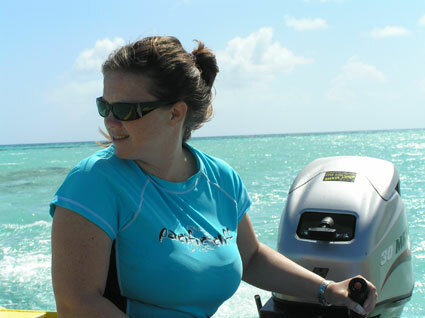 Bronwyn is responsible for the day to day management of the Coral Reef Ecology Laboratory. Skilleter GA, Pryor A, Miller S, Cameron B. (2006) Detecting the effects of physical disturbance on benthic assemblages in a subtropical estuary: A Beyond BACI approach Journal of Experimental Marine Biology and Ecology 338 (2): 271-287. Grutter AS, Cameron B, Kuris, AM, McCormick, MI, Warner RR, Swimming performance and parasite load in several larval fishes. In prep.